This book is essential reading for all those managers, investors, and traders as well as government officials who do business in or might in the future have dealings with Japan. More than most people living in a rich, developed country, the Japanese still place great store on traditional values and cling to a culture that is both varied and unique. Business etiquette and general good manners are not only dissimilar, but they are strictly prescribed and adhered to by those with whom you will negotiate and socialize. Getting things right can only help you, but it is incredibly easy to get things wrong and never even know it. Politeness dictates that you will not be told when you make mistakes or irritate people, but when you inevitably do so, the price you pay, as a minimum, can be to suffer slow negotiations with the attendant increased costs in time and money. At the worst, you might lose an entire contract or fail to break into the Japanese market at all. This book will help you to adjust quickly, make friends easily, and interact more effectively; all of these can help you achieve your goals more rapidly, gain repeat business, and generally be more successful. You will learn many of the basic concepts of this fascinating culture that will help you to understand better what is going on. You will discover how the Japanese like to do business, who should be on your team, how you should behave for greater success, what to expect at meetings, and what you should do there. Advice and hints for living in Japan and running a company there are supplied and there is a whole chapter on what to expect if you are a woman or your team includes women. A further chapter covers the important issue of what to do when a Japanese team visits you in your country. Written by Dr. Kevin Bucknall who has lived and worked for decades in Asia and Australasia, this book should be a welcome addition to the library of any adult who deals with or works in that fascinating but mysterious country, Japan. 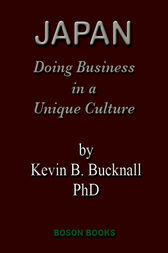 Boson Books also offers this book and Chinese Business Etiquette and Culture by Dr. Kevin Bucknall in print. For an author photo, bio, and a sample read visit bosonbooks.com.